Underwater exploration around St Thomas Island on Bulgaria’s southern Black Sea coast by a team of specialist archaeological divers has led to the finding of what are believed to be the remnants of a wall of an ancient Thracian fortification. This was announced in a statement after the conclusion of the underwater exploration, carried out over five working days up to August 10 2018. St Thomas Island is 15km south of the Bulgarian seaside town of Sozopol and is a mere 0.012 square kilometres in size. Led by Professor Ivan Hristov, the dive team explored all sides of the island, up to a depth of 15 metres. Two places with low concentrations of fragmented ceramics were mapped. The first area, where highly fragmented ceramic vessels with the most general date of the first millennium BCE were found, is on the southwestern extension of the island at a depth of only one metre. Several stone blocks with straight walls and traces of treatment, some a metre in length and width, were found here. The blocks are perpendicular to the underwater reef. This is probably a previously unknown fortification wall of the ancient Thracians. On the southern side of the island, at a depth of nine metres, the team found part of a late antique amphora and well-worked limestone blocks that were designed for construction work on the island in ancient times. Archaeologists are categorical that the island was a peninsula in the past. The evidence is the broad reef between the island and the latter-day shore. In the middle between the land and the island the deepest part is only two metres. Given the general rise of the level of the Black Sea waters in the period of the seventh to 13th centuries, the great isthmus connecting Saint Thomas with the mainland was flooded. It should be taken into account that all the flooded structures in the coastal zone of the late Roman province of Haemimontus are at a depth of 0.50 to 1.40m. The earlier constructions of the Hellenistic and Classical Era may be sought at a greater depth, of 6-8m. These previously announced calculations are indicative of a radically different coastline in the ancient times of the present as well as relatively larger terrestrial area of ​​the Late Antiquity sites. 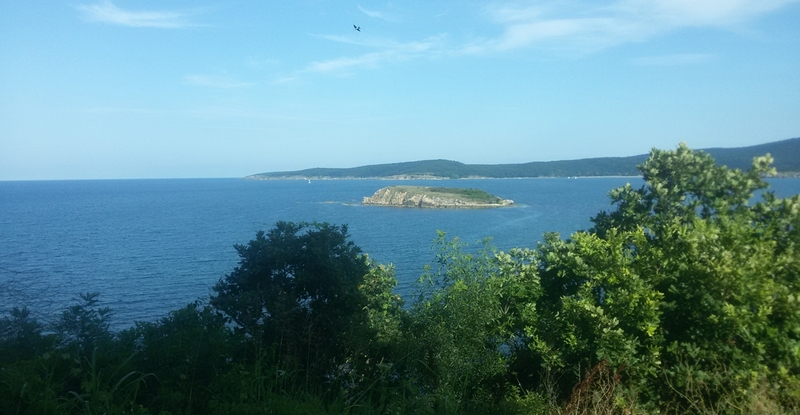 The underwater explorations were a natural extension of the land surveys on St Thomas Island since June, where a Thracian sanctuary, structures from the late antique era and a mediaeval monastery were found and partially excavated. The team that carried out the surveys on land and underwater is preparing a detailed publication for its research and is already planning new sea adventures related to the National Museum of History programme.